Episode 2 of The Nosh Show is up! 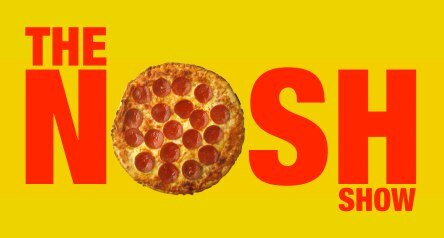 Head on over to The Nosh Show website to listen and to see a complete rundown of everything we talk about. Please feel free to let us know what you think! I don't know how long I can keep up the trend, but I'd like to throw at least a bit of a review in with each new episode announcement of The Nosh Show. Since we'll be starting the show with a followup to the last episode, I decided to make a run into KFC to check out the new boneless chicken.... unfortunately I picked a KFC / Taco Bell combo store that lacked a frozen drink machine (so no Mountain Dew Baja Blast Freeze for me to try, though that's probably for the best). So here's what $4.99 plus tax got me (medium sized watered down fruit punch not shown). 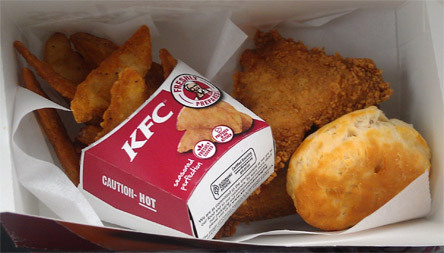 It's two pieces of KFC original recipe boneless chicken, one very dry biscuit, and a small spilt order of french fries. Grubgrade reported these new chicken things were bad, and they were right. It's chewy, over-processed, and lacking that true KFC burst of flavor... and that was the white meat part. The dark meat was just disgusting and seems to be more deep fried fat than anything else. I'm better off throwing some shake & bake on some boneless chicken thighs from the grocery store (kind of like the leftovers I have for lunch today). What a waste! At least the fries were decent. I enjoyed their unique shape and mild flavoring.